The chart below indicates the uncoupling of inflation and dampened volatility for the first time since 2007. You know, the year before 2008. Which you may remember from such events as the crashing stock market. Throughout the post-crisis era higher inflation expectations have coincided with lower volatility and higher risk asset prices. We believe the assumption that this relationship continues explains why so many forecast, or want to see, inflation’s return. It signifies a strong and robust economy that financial markets should want. However, this relationship is on the verge of flipping. 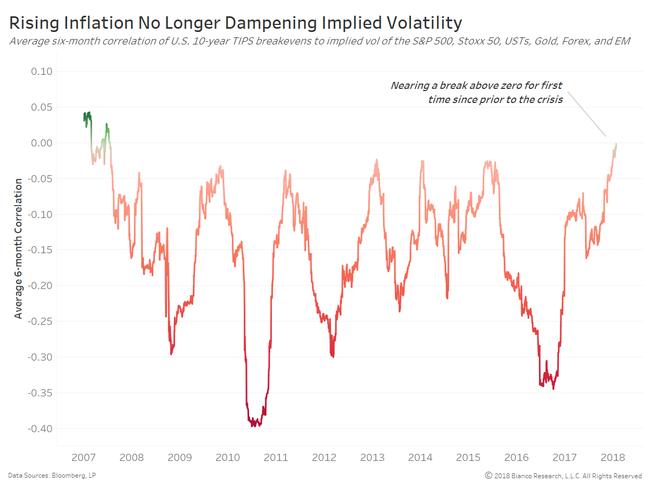 Higher inflation expectations may soon be a recipe for higher volatility and lower risk asset prices, as they were pre-crisis and especially in the 1970s to 1990s.